LOLL 86: Full interview with Daniel Burton, the first human who bicycled to pole! Full interview with Daniel Burton, the first human who bicycled to pole! Let`s make it clear. You are not some retired pro athlete or mountaineer or adventurer or something? Growing up I was never very good at team sports, basketball, baseball, football etc. In fact I was always the last person picked to be on any team. But I was active. I hiked a lot with my father and brother in the wilderness areas of Utah. In high school I was one of the computer nerds. After school I worked as a computer programmer for WordPerfect and Novell for 23 years before I was laid off. During that time I got a bit out of shape and my cholesterol got real high. I took up biking a few years before I got laid off and it fixed my health issues, so when I got laid off I decided I wanted to do something to help others get healthy and opened a bike store to get people out riding bikes. I really am just an ordinary guy that loves biking. I have a wife a four kids. My oldest son is working on a PhD in math at Michigan State University. My oldest daughter just finished serving as a missionary in Croatia. My second daughter is a social worker working with kids, and my youngest son is finishing up high school. After he graduates from High School he will be going to Spain to be a missionary. My wife teaches high school and I spend most of my time working at my bike store. I try and get out and ride my bike as often as I can, but sometimes I have to put in so many hours at the store it is hard to get out and ride. Usually I ride at least a few miles every day. And what you exactly did, December 2013? On December 2 I started my expedition by bike to the South Pole. I arrived at the South Pole on January 21. How did you get such an, er, pretty crazy idea? People started asking about fat bikes. I knew about fat bikes but until people started asking me about them I wasn’t very interested in them. So in December 2012 I bought 4 fat bikes to use as demos in my store. Then someone told me about Eric Larsen’s attempt to ride a bike to the South Pole. I started reading his blog, and was sad to hear that he didn’t make it. I had my fat bikes by the front door of the store. As people came into the store they would ask me what those bikes were for, and I would tell them about Eric’s South Pole expedition. I had one customer that would tell me that someday he was going to win the lottery and then he and I would bike to the South Pole. My son was always coming up with ideas to do a Kickstarter (crowd funding) project. I started to think that I could fund an expedition using Kickstarter. So I looked to see what it would take to do a South Pole expedition and found out about Antarctic Logistics and Expeditions (ALE). 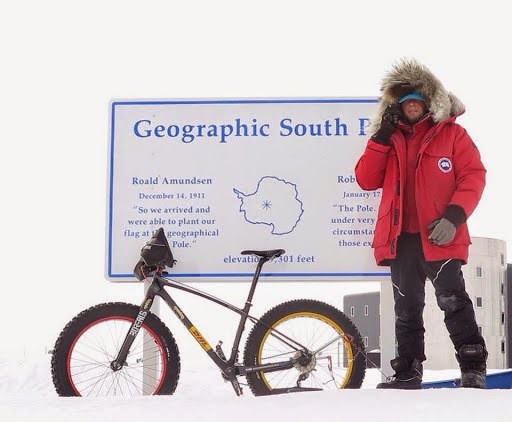 I figured using ALE it was actually possible for me to do a bike expedition to the South Pole. I studied Eric Larsen’s expedition and other expeditions like Hannah McKeand’s expeditions. Reading Eric’s blog convinced me that it would be possible to do the expedition. I then got so obsessed with the idea of biking to the South Pole that I could not turn down the opportunity to do it. Whta kind of faces did you saw when you talked about the idea to you relatives, friends etc. At first my wife didn’t think I was serious. Overall she thought it was a bad idea since we have been struggling finically ever since I opened the bike store. I had some friends that told me “Don’t do it!” They were worried that I would die. I would tell everyone that came into the store about my plan. A lot of people didn’t take me seriously, thinking there was no way I could do it. I had people that had been to Antarctica basically laugh at me telling me that there was no way it could be done. I had people on online forums telling me I was a fool, that I was being irresponsible to even attempt it. I had some friends that were supportive of my plan, but when I got back most of them told me they thought I would die trying to get to the South Pole. I can only imagine what kind of faces you saw if you talked about the idea to your potential sponsors. It is hard to get sponsors on board. There are a lot of people looking for sponsorships so companies get a lot of requests. It was a lot of work but I found some great companies that helped me out a lot. How did you really managed to get money behind yout really crazy idea? What kinda text you talked everybody? I think you are awesome selfpromoter. OK, I suppose there were tons of disappointment too. My Kickstarter project didn’t work. I then set up a GoFundMe project and got donations from a some great people, and I had people come into the store that donated money. It was great help, but wasn’t even close to enough for the expedition. Eventually I ran out of time to raise funds. I didn’t know how I was going to pay for it, but couldn’t stand the thought of not doing it. I haven’t made any money in 6 years so when I went to get a loan from the bank for the expedition it was hard. Imagine asking a bank for money and when they ask you how much you make you tell them that your annual income is $0. However before I opened my bike store I bought a house to fix up. I was able to get a loan on my house because I had a second house that I can move into if I can’t make the payments. OK, you got some money. Who was helping you mentally, with data, with information etc? ALE helped a lot with information I would need for the expedition. I also read a lot of blogs from other expeditions. With all the studying I had a good idea of what I would be up against. Well, let`s go on. You are in Antarctica, just stepped out the plane. Where was it? I flew from Punta Arenas Chile to Union Glacier in Antarctica. ALE has a base camp on Union Glacier that they use for people doing South Pole expeditions and also for mountain climbing expeditions and penguin tours. It is pretty popular place for extreme skiers I suppose? There were a lot of people doing a lot of different things. It was impressive to be surrounded with so many people that were 7 summit climbers. I always wondered why you did not choose the McMurdo to Pole snow road which is much more suitable fot bicycling? I looked at that, but it seemed that all of the real expeditions start at places like Hercules Inlet. The snow road from McMurdo to the South Pole would be easier but it makes it more of a bike ride than an expedition. Juan Granados was there too? Did you talk with each other? Was he some kind celebrity or star? Yeah, we talked before we left. He had a lot more expedition experience. A few months before our South Pole expeditions he did a bike expedition across Greenland. One day as we were eating dinner at the base camp he confessed that he had really skied across Greenland and didn’t use the bike much. He then told me he would not claim to do something he hadn’t really done. He also would tell me that he wasn’t worried about it being a race. However it was apparent before we left and during the expedition that he was very concerned about getting to the South Pole first. OK, you are in Hercules Inlet. With dozens of skiers. What was the biggest surprise for you at first? There were only a few other ski expeditions that were going to the pole this year. When I got dropped off at Hercules Inlet I was alone. All the ski expeditions had been dropped of a day or two before I was dropped off. I don’t know that there were any surprises. At the base camp it was nice though to be able to sit and talk to the other people that were doing expeditions. I was the only one there that didn’t have any real experience and so I would listen and learn as much as I could from the others. Is Antarctica a really special place? Yes. The base camp was very scenic with all the mountains around it. However for most of the expedition all I could see was an endless horizon of snow. At which point did you decided to start the expedition? We had to wait for a clearing in the weather so I could be flown to my starting place on the coast. On December 2 I was able to start. What kind of things you took along? ALE provided a good list of equipment that is needed for ski expeditions. I followed their list but of course added a bike and biking gear and didn’t take any of the skiing gear. I read you blog and I suppose your first miles were really hard? I knew the first 30 miles would be extremely difficult. It is where most of the climbing is, and where the snow would be the softest. Also the strongest headwinds were during the first couple of weeks. I wasn’t able to test my equipment in expedition conditions before I left, so I had a lot of learning I needed to do. I was using two sleds and panniers. I spent time adjusting the weight from panniers to sleds and figuring out what would work the best. And bicycle seemed a bit stupid idea? No, I think the bike is a great idea. At the beginning and at the end skiing is much more efficient, but during the middle part of the expedition the bike worked very well. What was the most difficult cycling in Antarctica? It was all very difficult. I think the hardest part of the biking was pulling the sleds. However the sleds were still better than having the weight in the panniers. The soft snow and steep climbs were very difficult, but I think the katabatic winds were the biggest problem for the bike. The panniers and sleds would catch a lot of wind and make it very difficult to move forward. The weather was bad at first and you saw some adventurers turning back and returning to bace camp. And Juan was changeing from bike to skies? All of the South Pole expeditions this year were successful in reaching the Pole. However Richard Park was trying to set a speed record. His first attempt was not going to break the record so he skied back to the start to make a second attempt. Juan passed me a couple of days into the expedition. When we were at base camp preparing for the expedition I was going out with my bike testing my setup. Juan was going out on his skis testing his setup. I knew at that point that he would be doing a lot of skiing. When he passed me he was skiing and in his blog he stated that he didn’t use his bike for the first 10 days. What did you think then? You didn`t thing about returning? I knew the first 30 miles would be hard, but expected it to get better once I got done with the steep climbs. However after the first 30 miles I still was not getting enough miles in a day to make it to the pole. I figured I would not make it. I had already decided before I left that there was no way I was turning around and so that was not an option for me. I figured I would just go as far south as I could before running out of time. What were the biggest dangers at the journey? Cravesses? Cold? Exhaustion? I fell into a crevasse on my second day. We had looked at satellite images from ground penetrating radar before I started and planned a route that avoided the biggest crevasses. However I would be biking over areas that nobody had ever biked over before so there was no guarantee that it would be safe. During the expedition I biked over thousands of small crevasses, and at one point I looked backed and could see that I had just biked over a snow bridge over a large crevasse or sastrugi. Had that snow bridge broken on me it could have been fatal. I worked hard at avoiding cold injury. One of the biggest problems was that in order to keep your balance on a bike there is a minimum speed you have to go. Even to go that slow took a lot of effort and I would get very sweaty. If the sweat freezes it can kill you so I could not stop long for food. I had to keep moving to keep my temperature up so the sweat would not freeze. It was never easy. At the beginning the drifting snow was soft and difficult. One day there was very little wind and the sun made a full 360 degree rotation and it hardened up the snow. After that I was able to travel faster, and finally was getting enough distance each day to be able to make it to the South Pole. The last few days before the pole the snow got real soft again and made the end a lot slower. How did your normal day look like? Usually I would wake up, melt snow for breakfast and for water during the day. I then would take down my tent and then bike for about 13 hours. Most of the time I would stop every mile and get a drink and some energy food. Each day I had a goal of how many miles I would travel. I sometimes would have to go for longer than I had planned in order to hit my goal. I would then set up my tent and get my stove going to melt snow for dinner. It would get nice and warm in the tent, and the solar radiation would work well for drying out my clothes so that I could get going again the next day. After eating dinner I would write in my journal, send a blog update, and call ALE to tell them where I was. How the polar day looked like? Sun never disappeared? The sun was always at about 22 degrees above the horizon. It would just go around in a circle. The sun never went down the whole time I was in Antarctica. I guess you could say it was one very long day. How you managed the total loneliness? The loneliness didn’t really bother me. I was very alone and quit aware of that fact. It was really quiet because there was nothing besides myself making any noise. Not even the wind made noise other than when it would hit me or my bike. It gave me a lot of time to think, and I was more emotional than normal, but I enjoyed the solitude. How using the bicycle seemed for you in reality? Idiotic? Or, vica versa, better than in theory? You wrote that Juan Granados was cycling only about an hundred miles. How did you count it? Did you see him frequently? I only saw him when he passed me, and one day I got close enough to him that I could see his tent. He was usually about one day ahead of me and on the same route. I could see his tracks in the snow, so I knew when he was skiing and when he was biking. He never did put in a full day of biking and even when conditions were good for biking he spent most of his time skiing. How did you feel when you learned that Maria Leijerstam have reached t pole with her trike and she is heralded as the first human „biking“ to pole? Maria was a surprise. I didn’t know about her expedition until after I got to Chile. She did a good job of surprising everyone. Her plan, if it worked, would make it so that she would be able to be the first to get to the pole. She was saying that she was going to carry all her gear and the Arctic Truck would be following but not giving assistance. Her plan didn’t quite work though, she was unable to pull her own gear, so she moved all her gear into the truck. Did you see her or her team convoy? Yes, they went to the Pole on the South Pole highway but came back on my route. When I was at the halfway point they were also at the halfway point. I talked to the driver of her truck, I didn’t talk to her because she was sleeping in a tent. He told me that she had a relatively easy time. Her route was on a compacted marked road that has the crevasse filled in and packed down. Apparently things worked well for her once the truck started carrying her gear. The trike had troubles with snow drifts, but she was able to use her hands to turn the front wheels and essentially turn it into a three wheel drive vehicle. I was told that when she was tired she would take a break in the truck. It seems that it worked well for her, but was more of a ride than an expedition, and not even close to the same thing that I was doing. Estonian writer Juhan Smuul took part of the 3rd Soviet Antarctic Expedition (1958) and wrote "Antarctica Ahoy! : The Ice Book" (check out) about it. He spent a week in the Komsomolskaya station 74°06' S 97°29' E (Queen Mary Land). He wrote the air was so thin there that it made his feel very sick. Didn`t you feel the same when you got closer to pole. My house is at 5,000 feet of elevation and I bike at 8,000+ feet frequently. The altitude did not bother me until I got to about 9,000 feet. They say that physiologically the elevation at the South Pole is like being 2,000 feet higher than you actually are. I think that is true. 9,000 feet felt a lot like when I am biking at 11,000 feet. It makes it hard to breath but overall I think I handled it well. What did you feel when you saw the building of Amundsen Scott Station? I first saw the Amundsen Scott Station when I was 13 miles away from it. It was just a few dots on the horizon. It was the most wonderful thing I had ever seen. I knew I would make it, but I still had about 12 hours of biking left to get there. It is impossible to describe the joy I felt when I saw the station. How did you reach to the Pole and how it looked like? There is a camp at the South Pole for arriving expeditions. They took it down and flew it out the day before I got there. So when I got there it was deserted. When I got there I dropped off my sleds at the camp site, and finished riding to the pole marker, and then back to my sleds and set up my tent. I wasn’t disappointed, but I thought to myself, “OK, I’m here, now what?” It was very anticlimactic. When I arrived it was during the stations “night time” so everyone was asleep. Vesa from Finland arrived a day later and it was great to finally have someone to talk to. How long did you spend at the Pole? What were your activities there? I was there for one day before Vesa arrived. After he arrived ALE arranged a tour of the South Pole Station for us. We spent about an hour getting a tour of the station and then it was time to pack up our tents and fly back to Union Glacier. I was there for about 1.5 days. You flew back to the coast, spent some days waiting for plane to get back to America. How your health was? How did you feel? When I got done I had lost a lot of weight. I had no fat left on my body, and a lot of my muscle had been burned off to keep moving. Once I finished the expedition my body kind of went into a shutdown mode. I was weak and tired and spent most of my time eating and sleeping. Did your home look different when you returned? How people around you reacted? When I got home everyone started telling me that they were glad I made it back alive. I knew of the dangers before I left, and did not have any doubts that I would come back alive. I guess people think that going to the South Pole is more deadly than it is. The expedition was the most difficult thing I could possibly do, but it was not a high risk of death. Talk about your future plans. Will a film or/and book coming about your journey? How about your bicycle-to-every-kid project? I have a lot of debt now, so I need to work on paying off my expedition loan. I am hoping that a documentary and book can help with that. On one of my whiteout days I was trying to figure out how I could use the expedition to help fight diabetes and heart disease. It was then that I came up with the idea of the charity to give bikes to kids. We are setting up a program where we will take kids out biking. After they complete the program we give them a bike. What is your message to Estonian people, or to the whole world? You know, life is difficult. However if you keep going even when it seems like there is no way to succeed you may be surprised at what you can do. Will you go back to Antarctica? It would be nice to go back some day, but for now I need to work on paying for the expedition that I just did.